Over the weekend I stumbled across one of the most interesting things I've read online in a long time... a photo-journal of one woman's road trips through the radioactive wasteland known as the Chernobyl "dead zone." Thanks to her nuclear physicist father's credentials, Elena is one of a very few people in the world with security clearance to enter the "dead zone." These days, she frequently rides her motorcycle through the abandoned landscape, taking advantage of unparalleled expanses of open road. Fortunately, she's not just there for the asphalt; she is exploring and documenting the site of our planet's worse nuclear accident in unprecedented detail so that she can share it with the rest of us. Our journey begins in the evacuated farmlands on the outskirts of Chernobyl; here we embark on a guided tour to "ground zero," through an amazing wealth of photographs and a rare personal perspective. To offset what is essentially an account of the unthinkable, our narrator provides a steady stream of historical and scientific details as well as moments of sharp, sometimes unexpected, humor. You would think that the power plant itself would be the tour's finale and crescendo  a proverbial Mount Doom  surprisingly, the neighboring town, once home to 48,000 power plant employees and their families and now the single most toxic place on Earth, is far more compelling. I don't know what it is about exploring the sunken wreckage of the Titanic, the Paris catacombs or the winding tunnels under Egypt's Valley of the Kings but you get the same feeling here. Surveying the ruins of an abandoned park, the ground still littered with toys, Elena wonders if "future archaeologists will compare this town to Pompeii." It has been exactly 18 years since the day Chernobyl, once a town on a map that anyone could drive through, effectively died to history and became a monument to the Nuclear Age and its worst nightmares. 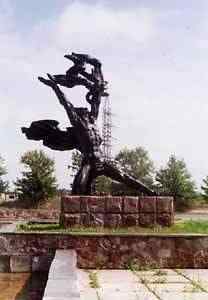 On the last page is a small photo of Chernobyl's own monument, a statue of Prometheus stealing fire from the Gods which once stood at the center of town. It has since been moved to the site of the plant... perhaps so that "future archaeologists" won't need to have everything spelled out for them.